Zac Curtis was claimed off waivers by Philadelphia on Monday. Curtis was designated for assignment by the Mariners on September 4. 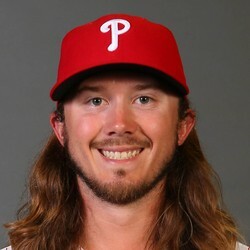 The Phillies evidently liked what they saw in the 25-year-old southpaw to claim him off of waivers. He made appearances in three big-league games this year for Seattle, all in relief, giving up three unearned runs on three hits (one for a homer), two strikeouts, one walk, two hit-by-pitch, and two wild pitches over 4 2/3 innings. His main body of work was performed at Double-A Arkansas, where he posted a 3.51 ERA, 1.21 WHIP, and an eye-opening 60/19 K/BB over 51 1/3 innings. He will likely have a role in the bullpen, and pitch in low-leverage situations as the season winds to close.